Nice lighting and very good detail, especially in the eyes. I think I might prefer a little less tight crop. But this one isn't bad at all. Message edited by author 2007-01-16 12:08:12. I must honestly say that I find the whole "head wrap" thing a bit played out...this image would have been just as lovely without the scarf...unless of course she is Muslim...then I might understand the head wrap. It is played out and she's not muslim you are right. I just did a little test to see if these scarf girls really do so good on DPC and I must say it did preety well. If my hand would of slipped too much on neatimage sliders, and make it look like a barbie doll probably I would of even made top 10. I know she's beautiful she's my whife to be, but taking advance of mother nature's nature's art (her beauty) and playing a bit of filters in PS is just too easy for me. I don't like too easy. I like to challenge myself to more than that, altho for a portrait there is not much else that you can do. This was just a little test. Very good picture. The eyes speak so much, and the colors and textures are so vivid. It is compositionally strong as the many patterns does not stray us from her magnificent eyes. You know the outstanding features of your model and you used it to the hilt. Love this. Very nice composition! Good Luck! Lovely face, especially the eyes. The focus is excellent everywhere except for one small area of the cloth, in the center of the fold between the face and the tree(?) This is probably a DOF problem. Still, this is a beautiful portrait. Beautiful lighting, composition and colors. Very nice image. The colors, the crop, her pose...all works well. Nice crisp shot with lovely color. Beautiful eyes. Nice capture. Beautiful eyes. The colors in this are very nice and complimentary to her and the textures of the tree and the scarf(?) also add to the appeal. Good composition and good use of natural light. I felt that her eyes should have been a bit more sharp in focus Lovely girl, nice colors. real colors, earthly face. I like this one alot. Lovely capture and tonal balance but can't see the point of the large dull area on the left. Beautiful textures. The folds in the fabric, the colors and the detail are amazing. Great model with beautiful eyes. Nice pose, great focus. Should do really well. Beautiful. Love the texture of the tree and shroud, they really compliment her. really enjoy this picture, lighting is good, color is great, good job!!! 10!!! very nice. im kind of frustrated with the hoods in portraits on this site, but this one is different and very well done. Oh baby, you know this is good! I would have cropped out the tree as it doesn't add to this portrait. The natural framing from the cloth is enough, IMHO. Very lovely Mambe. 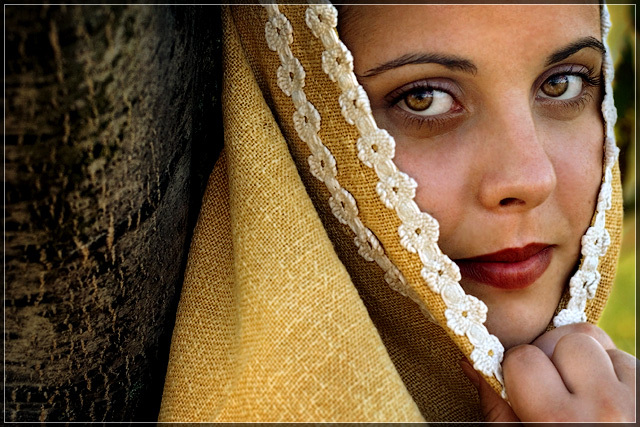 Composition is great with 1/3's of tree, shawl, and you. Nice natural skin tones with your eyes that look right at me. Good luck with this wonderful self portrait! Absolutely Amazing. The eyes, the veil, the tones are so warm and rich. Beautiful!! The color of her garments really brings out her eyes which are very pretty. The only thing...her skin tones seem a little splotchy. Proudly hosted by Sargasso Networks. Current Server Time: 04/21/2019 04:05:40 PM EDT.